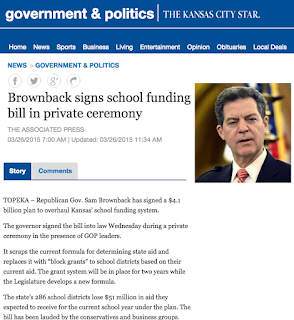 Kansas needs a stable, ongoing revenue stream that reasonably matches expense costs. Isn’t that logical? Income should equal expenses. But while that may be logical, the governor did not propose it, and so far, legislators have shown few signs of heading in that direction. The Kansas budget is structurally out of balance. Future general fund expenses are about $6.4 billion and rising. Income is about $5.8 billion and falling. The state’s bond rating was downgraded because of that structural imbalance, and it will go down again if lawmakers do not fix it. For two years, lawmakers have been patching up the budget by using limited sources of one-time money. In FY 2014, Kansas spent $6.0 billion from the general fund, but tax revenue only produced $5.6 billion. The difference was covered by drawing down the “balance” or “savings” in the general fund bank account. Now in FY 2015, Kansas plans to spend $6.3 billion, even after the governor’s mid-fiscal-year spending reductions. However, the official estimate for tax revenue is only $5.8 billion, and based on results-to-date, the actual amount collected may be lower. The gap is being bridged by wiping out the remaining balance in the savings account, transferring $155 million from the highway fund, and transferring more than $100 million from other funds. In FY 2016 the gap between revenue and expenses grows to $650 million. The governor proposes to address the coming gap by cutting expenses $217 million and raising revenue $433 million. However, the expense reductions are unlikely to stick, given that the advance of a school finance block grant bill that spends about $100 million more than the governor proposed. Half of the governor’s FY 2016 new revenue comes from one-time sources. (See the chart below.) Plus, the governor proposes that any revenue growth over two percent will be used to further lower income taxes, a provision that makes structural balance impossible without severe expense cuts. The structural problems in the Kansas budget grew out of unaffordable income tax cuts in 2012 that have caused a steep drop in revenue. Income tax revenue dropped $713 million in FY 2014. That’s the place to look to correct the problem. The state savings account has already been used up, but that did not solve the problem. 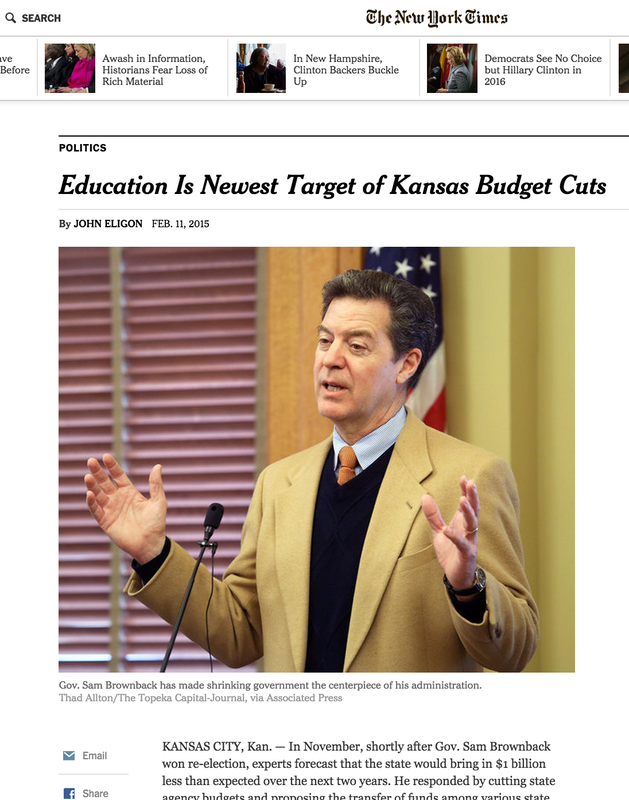 Instead, Kansas has been left in a very vulnerable financial position with little flexibility. Pulling more one-time money from the highway fund may prop up the general fund for another year, but it harms the state road system, and does not solve the main problem. Lawmakers must ultimately face the fact that financial health requires enough income to pay for reasonable expenses. — This entry first appeared on RealProsperityKS.org on March 19. February general fund revenue in Kansas was $22 million ahead of “expectations.” But it was $19 million below the amount collected in February 2014. How can that be? After all, the official revenue forecast predicts that general fund revenue will grow in FY 2015, not fall back. Maybe the “expectations” need some examination. To do so, look closely at individual income tax receipts. In FY 2014, individual income tax collections fell $713 million from the year before. 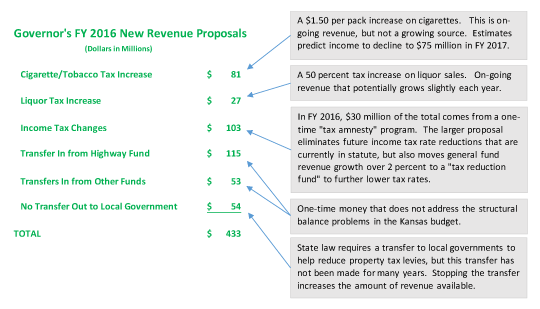 Then, all through the election season, Kansas lived with a revenue estimate, made last April, which predicted income tax revenue would rise back up in FY 2015 by $307 million. When the consensus revenue estimators met in November to update the FY 2015 estimate, they admitted the April forecast had been far too high. Their revised FY 2015 forecast now projects FY 2015 income tax receipts to grow $62 million. 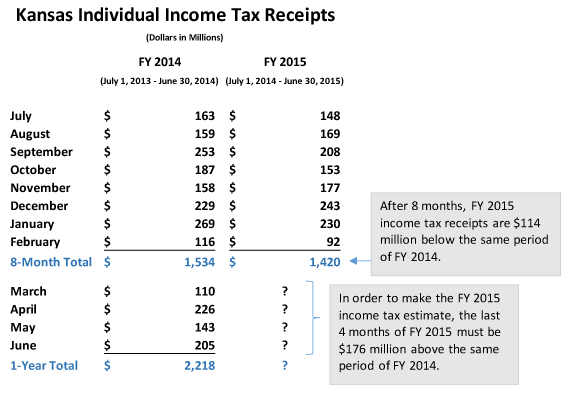 So far, though, individual income tax receipts have not grown. Rather, they have fallen $114 million behind last year’s pace. Does that mean Kansas revenue is back on track? Not at all. Income tax revenue in the months of February and March can easily vary many millions of dollars up or down, depending on how quickly income tax refunds are paid out. A fast pace of refunds makes revenue look lower, a slow pace makes revenue temporarily seem better. Last year the state paid out $140 million in refunds during February. Slowing the refund pace by just a few days can make a big difference. The “expectations” for February were set low, but the “expectations” for April and May income tax revenue are set high. Those are the months for which the Department of Revenue “expects” FY 2015 income tax revenue to eclipse last year. Perhaps it will, but don’t bet on it. Here’s the bottom line that everyone should remember: If FY 2015 revenue actually does grow enough to equal the current revenue estimate, then the FY 2016 budget hole is only — yes only — $650 million ($1.1 billion if the ending balance law is followed). If revenue does not meet projections, the budget gap is that much bigger. Kansas has a budget crisis brought on by the dramatic drop in revenue caused by the 2012 tax cuts. Meeting the FY 2015 revenue “expectations” does not even come close to solving the crisis. Without a substantial amount of new revenue, state programs will suffer far more than they already have. — This entry first appeared on RealProsperityKS.org on March 5.